Need a perfect last-minute gift? 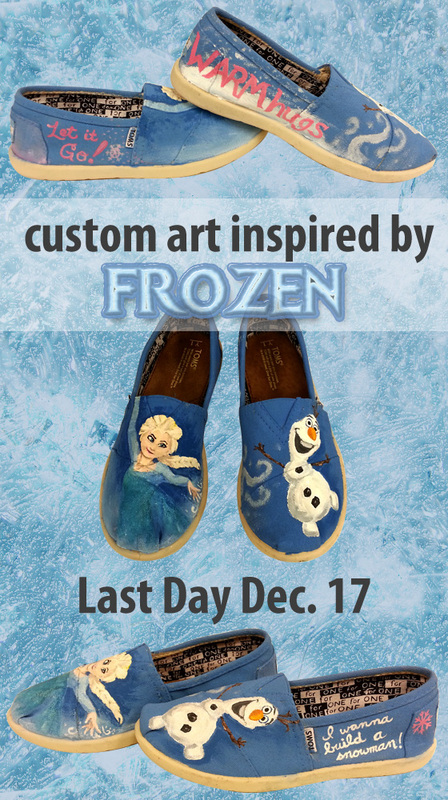 Buy regular price TOMS at Sachi, and save 60% on custom painting fees from a local artist. Sample pair artist fee is approximately $40; prices range from $10 to $45 depending on complexity and shoe type. Sachi is strictly a liaison between artist and customer and holds no responsibilities regarding artwork. Artist does not own trademarks or copyrights to any entities depicted herein; all such rights belong to their respective owners. No infringement is intended or implied. Custom pieces are final sale, with upkeep being the responsibility of the purchaser. This is a limited time arrangement, prices subject to change. Previous Previous post: An extra day to shop! Next Next post: Hanukkah starts tonight!